Welcome back to The Nick Broadhurst Show. I’m your host, Nick Broadhurst. You can catch all of my music, my podcast episodes, blog posts, music videos, everything I do is on my website at www.iamnickbroadhurst.com. 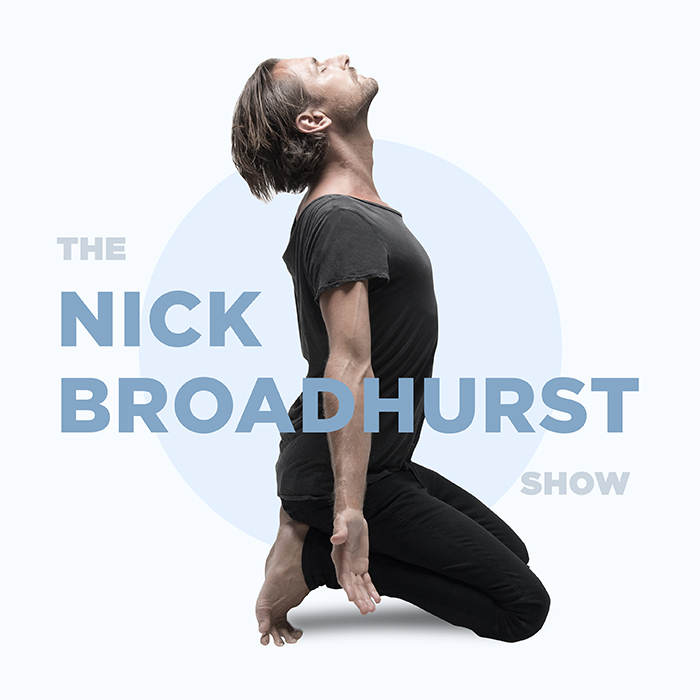 To check out my music, you can search for the word Nick Broadhurst in Spotify, iTunes, anywhere that you listen to music. The song we were just listening to is a song called Status Quo, and it’s relevant to today’s episode. I’ll let you feel into that and see why I think it’s relevant as we get into this sometimes heated topic. Just a reminder to go back and listen to episode number 40 first, and then 41 and 42. Do this Longevity series in order. So you can start at the very beginning at iamnickbroadhurst.com/40. Now, today we’re going to be continuing our discussion about the Blue Zones, and this episode is called ‘Eat More Plants’. Now, I know this topic is a very hated topic. When we start to talk about should we be eating plants, should we be eating animal protein, things can get really fiery, really quickly. But before we dive into that let’s talk about the Blue Zones and what they do. So in the Blue Zones they literally just have less access to meat. It’s not as available. So that’s an important thing to talk about. Really, meat becomes something which they have more in festive occasions and celebrations. In many of these cultures a large part of their animal protein actually comes from goat milk and not actually animal protein as such. Their staples, if we look at some of these cultures, in Sardinia their staples are, apart from vegetables of course, is durum wheat. In Okinawa it’s sweet potato and in Nacoya in Costa Rica, it’s maize. One important thing that they do with their corn is they first soak it in ash and lime, which is calcium hydroxide, for a long time and that unlocks more nutrients in the corn. So that’s something which we just don’t do in the west. It’s very, very important. If we look at the strict Seventh Day Adventists of Loma Linda in California, many of them or the strict ones are vegan. They get their dietary advice basically straight from their own interpretation of this following passage in the Bible which comes from Genesis 1: 29. “Behold, I’ve given you every plant yielding seed that is on the surface of all earth and every tree which has fruit yielding seed which shall be good for you.” They’ve had their interpretation, and for them that means to eat only plants. Now, what I found really interesting across these cultures is there’s one type of plant which really is a bit of a staple and common in all Blue Zones, and this is beans. I won’t get into the difference between legumes and beans. That’s a whole confusing topic. They’re essentially the same thing. But we’re talking about fava beans, black beans, borlotti beans, soy beans, these sorts of things and they’re common in all Blue Zones which is really interesting. I think they add a really good source of protein but an amazing source of fiber. I think in western diets fiber is so lacking, so lacking and I think that’s why beans are a bit of a magical thing. You know what, speaking of magic, I believe the magic in the diets from these Blue Zones, they come from the fact that their food is simple, anti-ego food. Anti-ego. Now sometimes some of these foods like grains, and legumes or beans can be considered poverty foods. But the thing about so-called poverty foods is that they are simple, they are anti-ego. They are free of the emotional attachment because we can attach so much emotion to the food that we’re eating. But to them it’s sustenance, it’s simple. They know what works, and they do it; they’ve got generations and generations, hundreds and hundreds if not thousands of years of their ancestors teaching them how to make these things taste great. Being free of emotional attachment, if you look at something like a bowl of coconut ice cream, sometimes these things that we take from their natural state and make them taste really, really good, sometimes too good, we can become connected and attached to those things, attached to the taste. So I do believe a large part of the magic in the Blue Zones is the fact that they eat simple, anti-ego food and that’s my own, I guess my own concept. Moving on, beans, whole grains and garden vegetables are basically the cornerstone of all the Blue Zone diets. I’m not going to make an assessment here about whether these things are right or wrong. It’s just a very interesting fact that we can all look at, we can all consider. If I really wanted to do a 10 hour episode, and prove to you that both grains are good and grains are bad, meat is good and meat is bad, or vegan is good and vegan is bad, seriously, you can convince yourself of anything you want. You can find anything to support any argument that you want if you really want to believe something to be true. The information is out there to support your belief. So I’m not here to impart my beliefs on you. I’m here to show you, possibly, a new way of thinking. I believe the key is to keep things simple. The simplicity lies in the title of this episode, Eat More Plants, eat lots of plants. Now, when it comes to protein, what do we do about protein? We choose what protein source is right for us. Is it a piece of steamed fish at dinner the size of your palm? Or is it a bowl of quinoa with black beans and vegetables which is also loaded with protein? And I do believe that very, very few people actually need animal protein three times a day. There is no one-size-fits-all when it comes to this constant debate. To say that we should all be paleo, or be keto, or be vegan or vegetarian, or raw, that is simply us inflicting our beliefs on others and blocking the natural flow of intuition that allows the individual to feel into what is true for them. The topic of whether or not we should be eating animal protein, man, that can get so heated at times. I get a lot of messages from people assuming that I’m vegan. As if somehow being vegan makes me a more compassionate person. I think the issue here is really about judgment. I’ve gone through stages of really overdoing animal protein and I think the lesson that we can all take from the Blue Zones is that animal protein is just generally way over-rated in most of the civilized world. That’s not rocket science. Really, it’s not rocket science. I don’t know if we can really debate that. Even just back a few years ago my body loved that animal protein and that fat. It was in a re-building stage. I was coming out of all sorts of interesting health challenges. But now, I crave being lighter and I tend to seek out that a lot in my foods. I know that animal protein is good for my healing right now. I’m still optimizing some things in my health. I know that it’s supportive to me and to keep my naturally catabolic vata pitta ectomorph body type in a state of anabolism, I do need a bit of the animal protein, just a bit. Because if I get too catabolic I feel crap. I lose weight. I become weak. This is what bio-individuality is all about, doing what is right for you, today. Now, if you’re a vegan but all of a sudden you just feel like your body needs animal protein, do it. Don’t judge yourself. Be gentle, be kind to yourself. If you’re paleo and you feel like it’s time to get more or totally plant-based, then try it. See how you feel, be adaptable. Let your own experience be your guidance. Listen to your beautiful body. Hear what it’s trying to tell you. It’s an incredible messenger. So right now my diet personally, and this is just me, please don’t follow me, is basically all plants except for that serving of animal protein that I have each night. If there is one template that I feel kind of safe in suggesting, because I know that people will definitely want a suggestion around what to eat, and I find that really, really challenging. I get asked all the time and I’m a musician, I’m an entrepreneur. I’m not someone like Stephen Cabral who has 250,000 client sessions under his belt. But I have learnt a lot. I have read a lot. I’ve spent a lot of money on this and it served me really well what I’m about to tell you. So, try this as a template. See how it goes. If it works, awesome! If it doesn’t, chuck it out and tell me. So the first thing is trying a smoothie for breakfast so that your body is properly hydrated after about, let’s face it, 10 to 12 hours of becoming dehydrated. How does that look? Well it’s really up to you. For me, it’s a cup of blueberries, a couple of scoops of a vegan protein that has added minerals and nutrients to support the body for the day, sometimes a fat like coconut oil or macadamia oil, because genetically I’m a MUFA, my body loves monounsaturated fatty acids. Coming up in tomorrow’s episode, blueberries and berries in general, will be the front and center hero in tomorrow’s episode. So definitely stay tuned for that. The next part I think is key, which anyone can try, and that’s try a vegan lunch. Not rocket science. It’s one way to make sure that you’re getting loads of nutrient dense plant foods into your diet. Fill up on plants at lunch. Not too hard. Lastly, at dinner, still go nuts over your veggies and choose what that last 5 to 10% of protein looks like for you. One night, it might be fava beans, and another night it might be fish. And that’s cool! It’s totally up to you. I think that’s a template that’s pretty hard to debate because we can all fit into that with all of our different preferences. I’ll leave that to you to feel into what is right for you. But right now in this moment, what works for you now may be totally different for you tomorrow and that’s cool. Besides, seriously, where do we draw the line about what is a living or sentient being? In the seminal book The Secret Life of Plants, it clearly shows that plants have consciousness, that they have intuition and feeling. You know, people get so fired up about this topic, but that is coming from a position of right or wrong. But in this universe which we all share, there is no thing as right or wrong. There is just Ying and Yang, and masculine and feminine, Divine order, balance. It’s judgment free. Black does not judge white. Love does not judge hate. It is, just is, what is. So please, can we pause? Can we take a deep breath? Can we stop telling others to be compassionate and judging them for their decisions? Just start to be more compassionate towards each other, to allow each of us to tread our own path, to learn our own lessons. It is time to stop arguing about whether the last 5 or 10% is tempeh or turkey and just focus on a plant-based diet, however that looks for you. That’s it for today’s episode, number 43 of The Nick Broadhurst Show. You can catch all the show notes at iamnickbroadhurst.com/43. You can also get a full transcript of the show so you can read my little rant in fine detail in all its glory. Don’t forget to make sure you hit Subscribe because when you subscribe, all these episodes will pop up in your podcast app which is awesome because there’s actually 10 episodes in this Longevity series. We’re going to go deep. I want to support you to live a long, happy, healthy life because that’s my mission and we teach what we most need to learn. So please head into iTunes and leave me a five star review and tell me what you love. Tell me what you want to hear more of, I’m at your service. And if you can please share this on social media today with someone that you love, or just share it with the world, that’s cool too and use my handle @IAmNickBroadhurst. And remember today, look up. See the beauty around you. See the beauty within you. Be gentle with yourself. Don’t judge others. Be compassionate to others. Let others tread their own path, learn their own lessons while you learn your lessons. Be love, listen to your intuition, and as always, have a beautiful day. I love you heaps. Ciao! Pleasure :) Thank you for being here.